Our friends at Content Marketing Institute and MarketingProfs have released their 2018 B2C Content Marketing Benchmark and Trends Report. As always, it’s stuffed with interesting facts and figures. I have always found this research to have a good pulse on the reality of the content marketing business, and this year is no different. I encourage you to read the entire report. It’s worth the time. 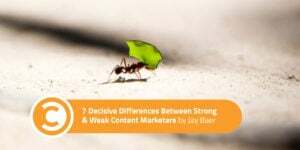 But the specific element of this year’s research that I found most interesting is the data comparison between “most successful” and “least successful” content marketers. Note that these are self-identified labels. If a survey participant characterizes their organization’s content marketing approach as “extremely successful” or “very successful,” they are classified as a “most successful content marketer” in this research. Conversely, if the respondent claims their organization is “minimally successful” or “not at all successful” at content marketing, they are classified as a “least successful content marketer” in the report. It’s also important to recognize that the participant pool is not vast—195 total for North America. And, while I have no evidence of this, I strongly suspect that people who think they are good at content marketing are more likely to take a detailed survey about content marketing versus people who think they and their company are mediocre or worse at it. With those caveats in place, let’s look at seven areas where there are interesting gaps between what “most successful content marketers” think and what “least successful content marketers” think. Nearly all (93 percent) successful content marketers say their organization is extremely or very committed to content marketing. This is a huge contrast with the least successful content marketers; just 23 percent of them say their organization is similarly committed. This isn’t a surprise, right? If the company believes in content marketing, the chances of that content actually working are likely to be much improved. The rallying cry of last year’s report was to “document your content marketing strategy.” This seems to have worked, as this year’s research shows a strong uptick in written strategic plans. The gap between the most/least successful content marketers isn’t quite as large in this area as in commitment, but it’s still huge: 59 percent of the most successful say they have a documented strategy, compared to just 18 percent of least successful content marketers. Again, this adds up. If the company is committed to content, they probably have a documented plan for it. It is interesting, however, that one out of every three successful content marketers appears to still NOT have a strategy, which seems like dancing on the edge of knife, at least to me. Among the successful content marketers, more than one quarter of total marketing funds (26 percent) go to content marketing. For the least successful, 18 percent. Now, 18 percent of all marketing is still a hefty chunk, and the difference between 18 and 26 points isn’t enormous. However, the least successful content marketers seem to believe there’s a correlation between budget and effectiveness. Why? 45 percent of them plan to increase content marketing spend in the next 12 months, compared to 35 percent of the already successful content marketers. 82 percent of most successful content marketers say their organization has realistic expectations about what content marketing can achieve. Fewer than half as many of the least successful content marketers say the same (40 percent). This one may be a self-fulfilling prophecy, as the survey respondents themselves may be the ones setting internal expectations. However, it would appear that commitment level and realistic expectations go together in the content marketing success formula, in most instances. Multiple studies of content marketers (and digital marketing on the whole) show that time pressure is the most common frustration for these professionals. This seems similar to the luxury of realistic expectations. Content marketers who think they are successful also universally believe they have enough time to do their job well. The phrasing in the study is, “Agrees that leadership team gives ample time to produce content marketing results.” When answering that question, 80 percent of most successful content marketers said “yes,” compared to just 36 percent of the least successful content marketers. This one makes a ton of sense, and the gap between the most/least successful content marketers is Kanye-West-ego large. When asked, “Our project management flow during the content creation process is excellent, or very good,” 56 percent of most successful content marketers said “yes,” versus just 11 percent of their least successful brethren. Project management acumen (and presumably, software) is evidently a big factor in content marketing success. This one fascinates me. 84 percent of successful content marketers say that they either always or frequently prioritize content quality over content quantity. This is almost double (43 percent) the response percentage among least successful content marketers. I’m not entirely certain how respondents judge quality versus quantity, as I’d argue that successful content IS quality content. After all, this isn’t a fine arts project, as I ranted about earlier this year. Yet, it’s remarkable that focusing on quality correlates so precisely with the most success/least success divide. Organizational support, as evidenced by commitment to content, a documented strategy, and budget. Practical thinking, as evidenced by realistic expectations and a focus on quality. Robust process, as evidenced by strong project management, and enough time to create good content marketing. 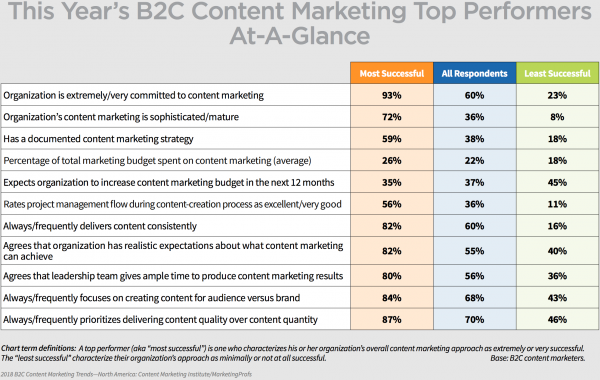 Are some people just better at content marketing than other people? Of course. But, based on this new research, it appears that organizational values, structure, and support are also major drivers of content effectiveness. I see that as a sign of a maturing industry, don’t you? Make sure to read the entire 2018 B2C Content Marketing Benchmark and Trends Report. And thanks to Content Marketing Institute and MarketingProfs for their hard work in putting this together every year.